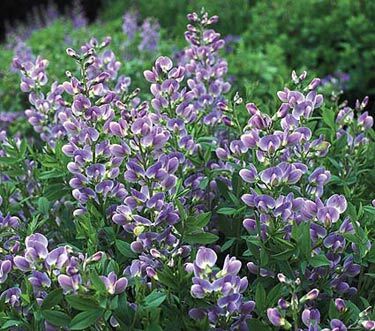 If you’ve never grown Baptisia, your garden lacks one of the most distinctive, elegant perennials you’ll find. ‘Starlight Prairieblues’ is a 2007 introduction from the breeding program at the Chicago Botanic Garden, and while the plant exhibits the same overall form as its parent plants (B. australis and B. bracteata), its bicolor blooms and increased vigor leave mom and dad in the dust. The deep violet-lavender buds appear in great abundance in early June, then unfurl into fetching periwinkle-blue blooms tinged with buttery cream at the heels. The flowers contrast beautifully with the plant’s blue-gray leaflets. Plants grow 3-4’ tall and become a formidable clump much quicker than B. australis. Mature plants will reach 3’ or so in width. Flowering in early to mid-June, the unusual foliage and stout nature keep plants attractive all season. Though usually listed as requiring full sun, plants perform well in light shade, with a minor drop in bloom production. False Indigos are very easy to grow and are rarely affected by pests or disease. Within a few years, a single plant will serve quite beautifully as a small to medium size shrub in summer and fall. Soil should be rich in organic amendments, with a neutral to slightly alkaline pH. Plants to not do well in sternly acidic soils. False Indigos develop a whopper of a taproot and are very long-lived, so plant ‘Prairieblues’ where you want it the first time. Zones 3-8.